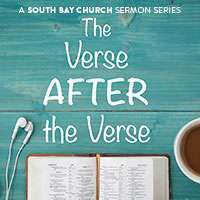 In this sermon series, we take the most popular Bible verses of American Christianity —pull them from the posters, coffee mugs, and T-shirts and dig a little deeper. In most cases, the context of these passages paints a much more vivid picture than our common understanding. In some cases, we often get it flat wrong in how we apply them. Join us for this sermon series, and let’s get to know the Bible a little better… together. "All good things" Romans 8:28 does talk about good things, but that does not mean that bad things cannot happen to us. It ultimately deals with the sum total of things that happen to us and whether we are obedient to His word. "For the good of those who love Him". God's love for us is infinite. Our love can be conditional. but the more we love like Him, the more we connect with the true nature of this scripture. John 3:16, is likely one of the most quoted and known about scripture all over the world. While most know the words, many do not truly know the context around the scripture. Jesus was teaching a religious leader at this point and was trying to help him understand Jesus as the messiah and savior of the world. Understanding this is the key to Christianity as a whole. Rejoice always, thankful prayers, & positive thinking. That was Paul's secret to complete contentment in Christ, even when in prison. We all phase good times and bad times. Holding tight to God is how we stay humble and faithful in any situation. Christ will provide the strength we need. We only need to utilize it. Many think that love is something that just happens; a feeling that comes over us. While it may start this way, true love is a decision. God's love for us is unconditional, yet we can often put conditions on the love we have for Him, and other people as well. 1 Corinthians 13 provides the truest definition of how we should all love, in every area of our lives. A Shepherd knows his sheep. God is the shepherd and we are the sheep. He knows all of us intimately, even if we don't know him. He cares for us and always sets us up for success. It is up to us whether we follow the path he had laid out. Sheep should obey their shepherd, but even they rebel at times. Ultimately, they need the shepherd far more than they understand. God does have plans to prosper us, however not always as we would want or expect. Part of the process is that we have to follow his plan for our lives. Just expecting that our lives will be blessed and perfect, without adhering to God's word and obeying it, is fool-hearty at best We need to walk the path he has set out for us, to gain the blessings he has laid forth in his word.